This is the biggest box I have ever encountered in the Technic line, but that makes sense with its contents being in excess of 3,900 pieces. 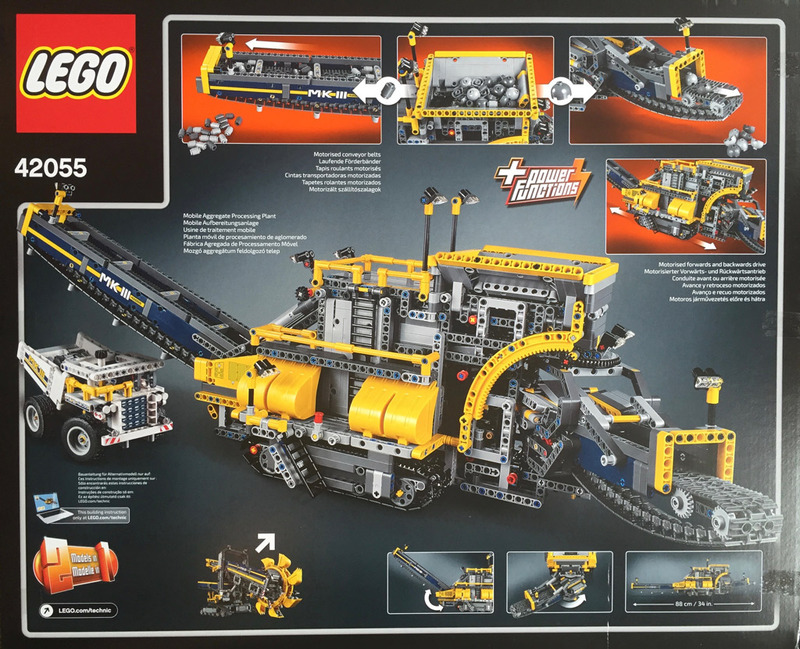 The box contains a flap showing all of the main functions of the excavator. Similarly striking is how the LEGO Group now delineate which functions are motorised and which are manual. Oddly, they do not mention how the boom height is adjusted here. The total amount of bags inside, excluding the ones containing the hefty 550-page instruction book and Power Functions elements, is 32. 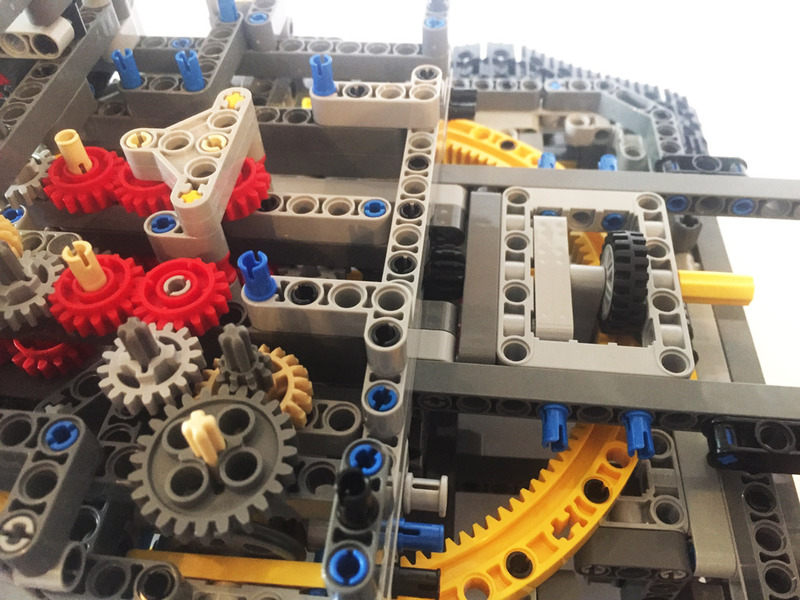 Just so you know where your money goes: of the 3,900 parts more than 1,800 pins are included, as well as over 140 gears (including gear racks and turntables) and over 270 axles. 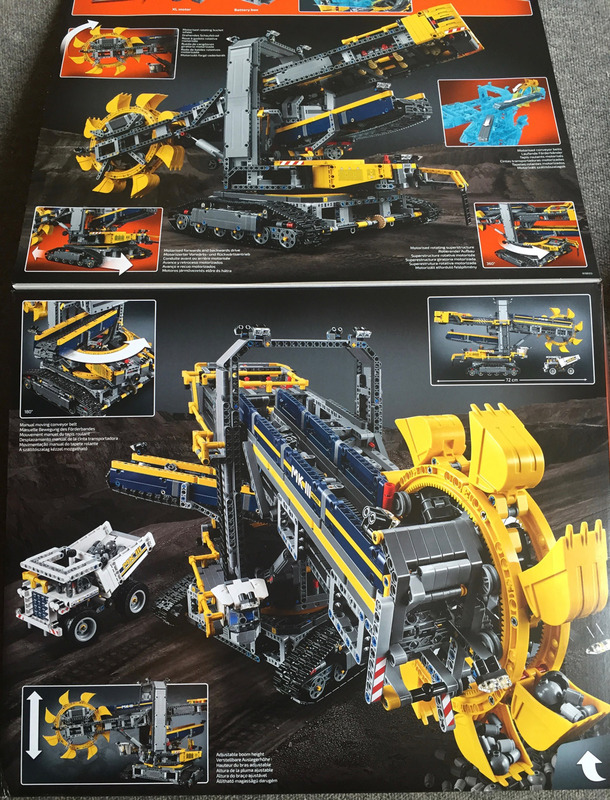 The amount of Technic liftarms and beams is just as impressive, numbering over 800. 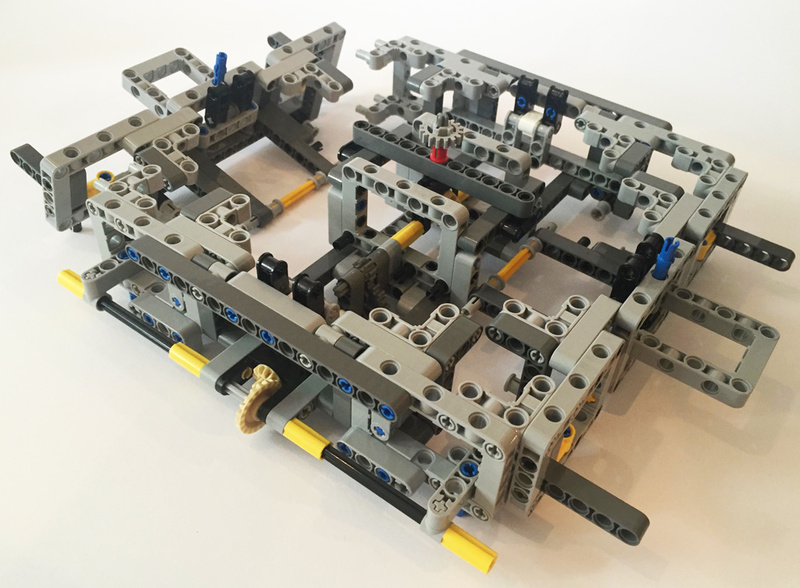 It is a true parts pack, perfect for designing your own LEGO Technic creations. 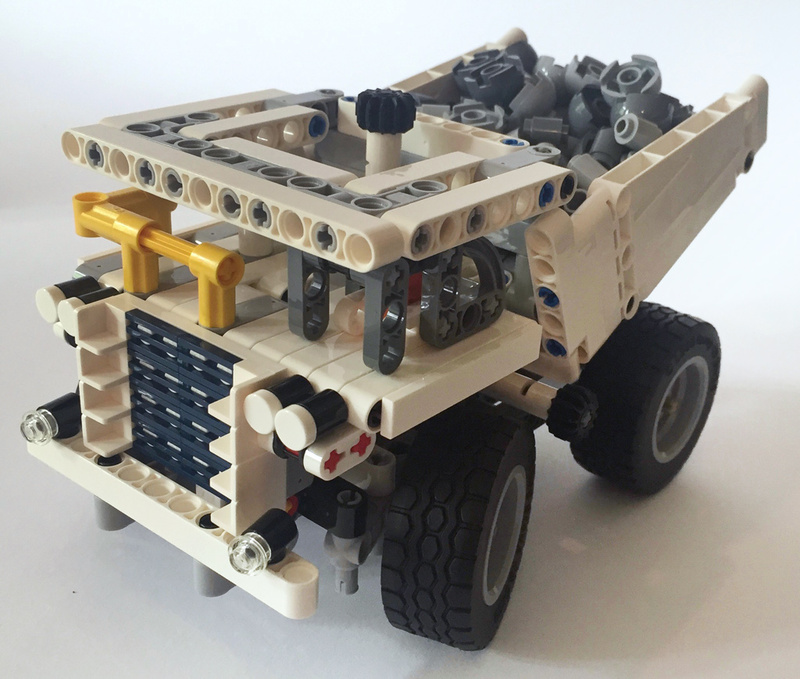 The first three bags, all numbered "1", are used to construct the white mining truck as well as containing an assortment of grey bricks used as stones. 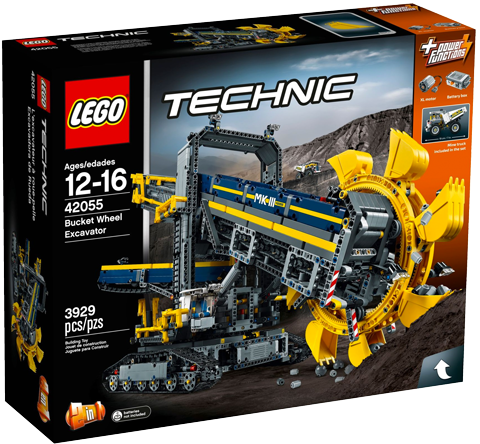 When the first images and videos of this set were shown to the world, a lot of people were worried the mining truck was an exact copy of the yellow 42035 Mining Truck which was only released last year. Rest assured: it is not. In fact it is a somewhat simpler rendition of that set, lacking the fake motor, and therefore only contains two functions: steering and raising and lifting the open-box bed. The bed itself is big enough to contain the total number of 112 bricks included as cargo. 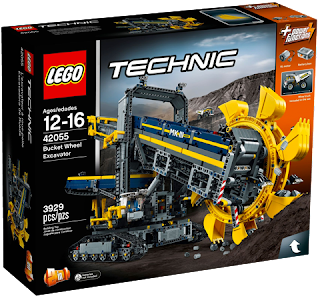 There is not much else to say about this mining truck other than that it contains 308 parts and is an utterly charming inclusion, adding much to the play value of the set and serving as an appetiser for the massive build that lies ahead. 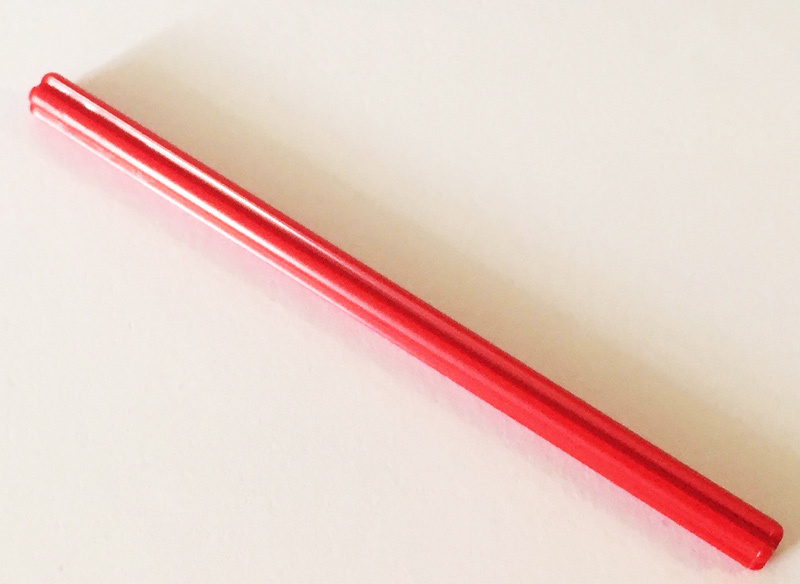 The only interesting recolour of a part in this stage is the Axle 10 in Bright Red [TLG]/Red [BL] (Element ID 6130005 | Design ID 3737) which hasn’t been seen since 2005 and shows up in two other sets this year. This completes the range of even-numbered axles in Red, because 42053 Volvo EW16E contains an Axle 12. Now it is time for the real deal, starting with the base of the bucket-wheel excavator. 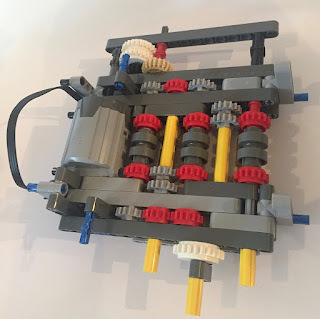 This part of the build consists of four numbered bags and also contains one of the two new elements released in this set. Before we get to that, it is important to emphasise that building the base of excavators is usually a rather repetitive task. Although this is no exception here, the vast scale of set 42055 makes it an enjoying and satisfying endeavour. 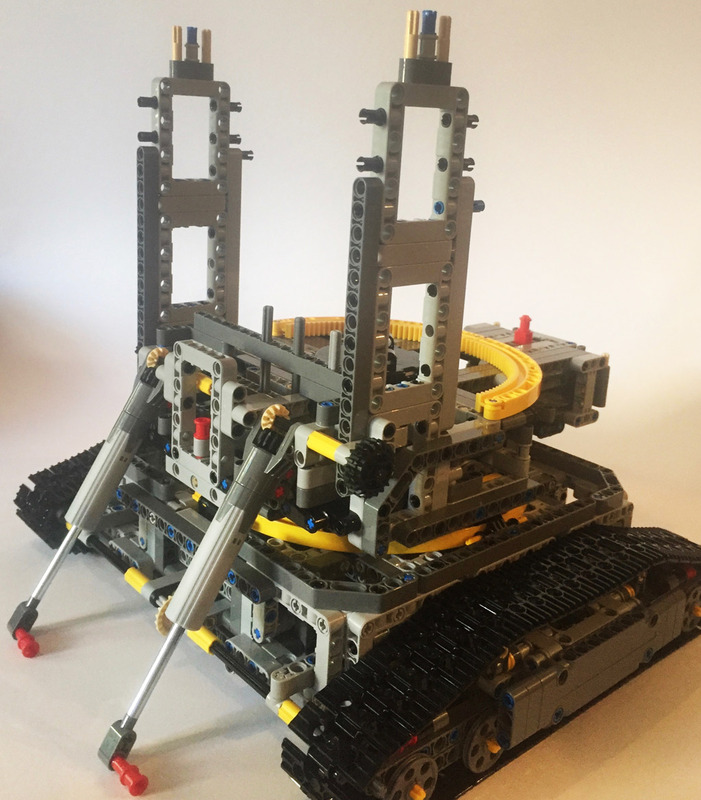 There are an impressive 53 5x7 Technic beam frames (Design ID 64179) adding much to the sturdiness of the lower structure and therefore allowing it to hold a lot of weight. 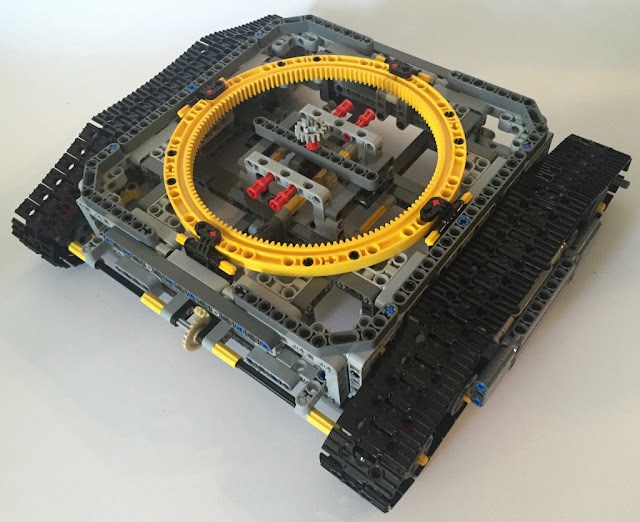 The centre of the base is formed by a turntable (of the new beveled type introduced last year) with an axle going through it that drives the tracks. This is accomplished by a rather straightforward assembly of axles and gears with a double-speed reduction. Like its real-life counterpart, this excavator moves very slowly. Considering the size of the machine, I was a bit surprised to see that only the front axle is actuated. 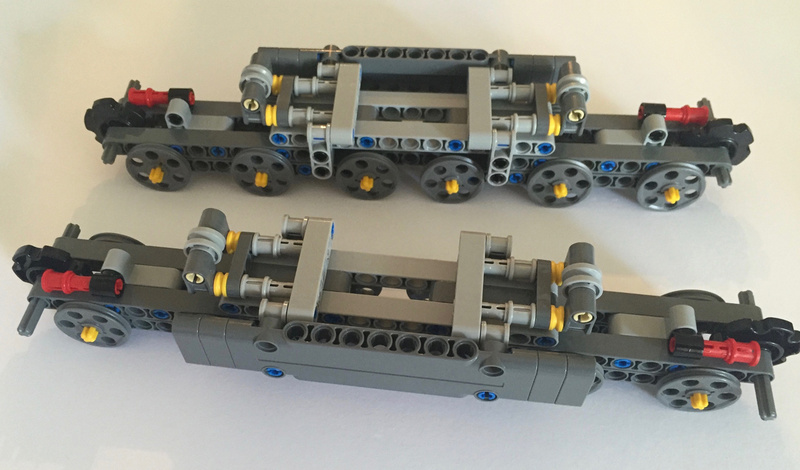 Although smoothly moving the thing on tracks is not much of an issue, it would have made more sense if both axles were linked to the central gear assembly. The construction of a central ring of gears concludes the base of the build. This ring is comprised of a new piece: a gear rack in the shape of a quarter-circle. It has inner 35 teeth (making the total circle 140 teeth), a diameter of 21 studs and it is cast in Bright Yellow [TLG]/Yellow [BL] (Element ID 6151167 | Design ID 24121). The rack has a half-stud thickness at the end, allowing it to combine with other gear racks of similar type. Besides the axle holes at the ends, it contains eight pin holes and one more axle hole in the middle. These are placed in a way such that pins attached to the structure below can hold it into place: a simple example of a perfect Pythagorean triangle. There are a total number of 14 of these racks included in this set. The third phase of the build focuses on the tracks, comprising two identical elements. To make that happen three bags are needed, one only containing black track pieces. A whole row of wedge belt wheels (Design ID 4185) and pins with stop bush (32054) are used. 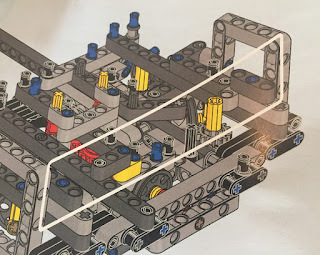 Even though building using only two elements may sound somewhat boring, the construction of these track parts goes surprisingly quickly. Once the 88 black tracks are attached, the base of this massive bucket-wheel excavator is finished. The base for the upper structure uses parts from five bags and, thus far, is the most interesting part of this already fairly impressive build. 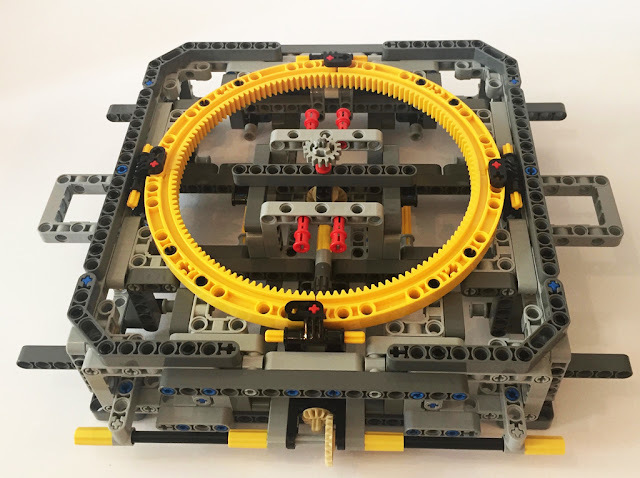 After the lowest layer of the upper structure is formed around the turntable, a complex array of gears makes sure all three motorised functions run smoothly and go up to the central gearbox in three parallel vertical axles. 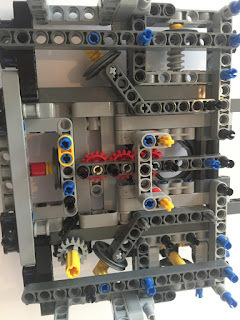 Most of this is accomplished with the use of rows of red clutch gears that can rotate freely around pins. There is also a worm screw, even though it has no function whatsoever in the A-Model. It serves a purpose in the B-Model. The number of gears is impressive and a series of wedge belt wheels are also added at the bottom of the upper structure. 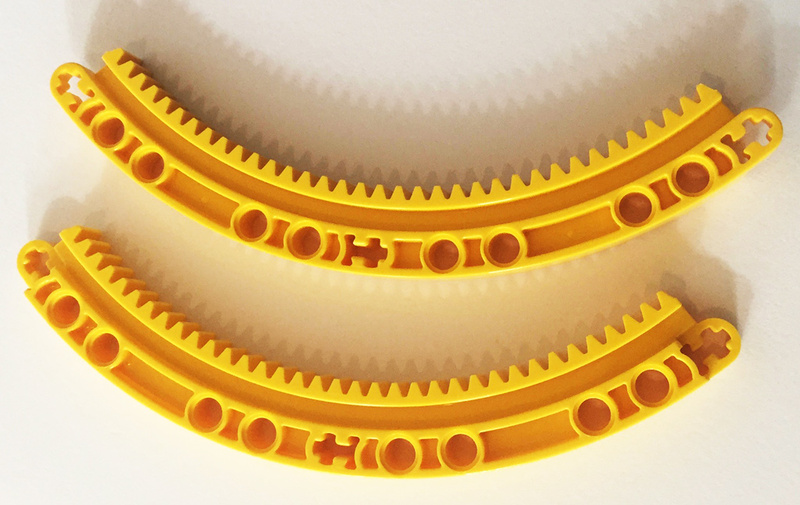 These will eventually roll over the arches of new quarter-circle gear racks, even though this is more for support than for making the upper structure rotate freely and smoothly over the gear-racked circle. Two parallel linear actuators are added before the upper structure is mounted on the tracked lower section. These are operated manually, which some may feel is a weak part of the design, but I honestly don’t think that tilting and lowering the heavy main boom with a motor would have been a good idea. There is too much friction involved and moving things by hand is much more reliable and satisfying. 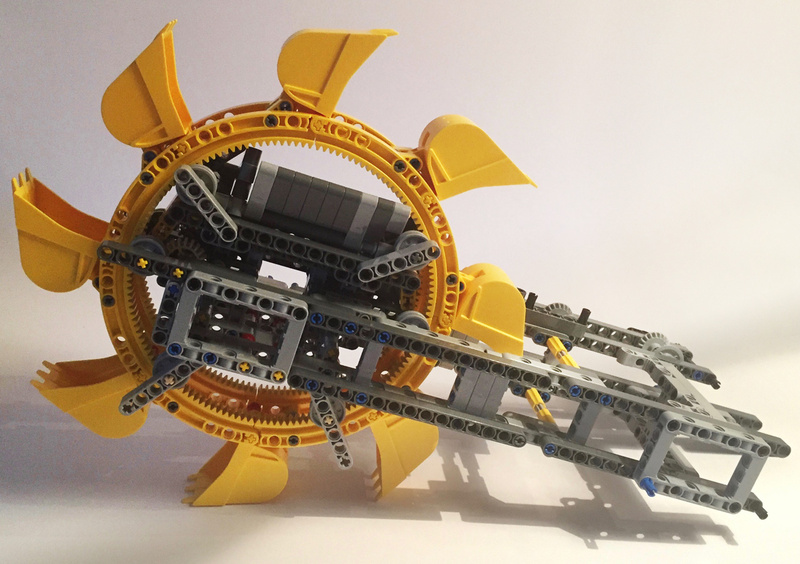 After the fourth stage of the build you will slowly see the bucket-wheel excavator take shape. The build is still pretty low at this stage, but you get a good sense of the majestic size of this set. I was surprised that this set is far more impressive and complex than meets the eye and there is much going on in the lower regions of this mammoth; most of the complex gearing is hidden from view. Because of the impressive size of this set, there are hardly any pages in the hefty instruction book that shows the model in its entirety. To make sure you don’t miss the region where parts are placed, white rectangular boxes are shown throughout the build. Also, some parts are either faded out or accentuated. I have not encountered this before and it is a very welcome addition. Let’s face it: we all start a build by neatly collecting the parts needed for each step but as the work progresses, eagerness wins over precision. The fifth phase of the build gives you all parts to build the small conveyor belt. It is comprised of two bags and also includes the 3x11 panel (Design ID 15458) in Earth Blue [TLG]/Dark Blue [BL]. A total number of 13 are included. 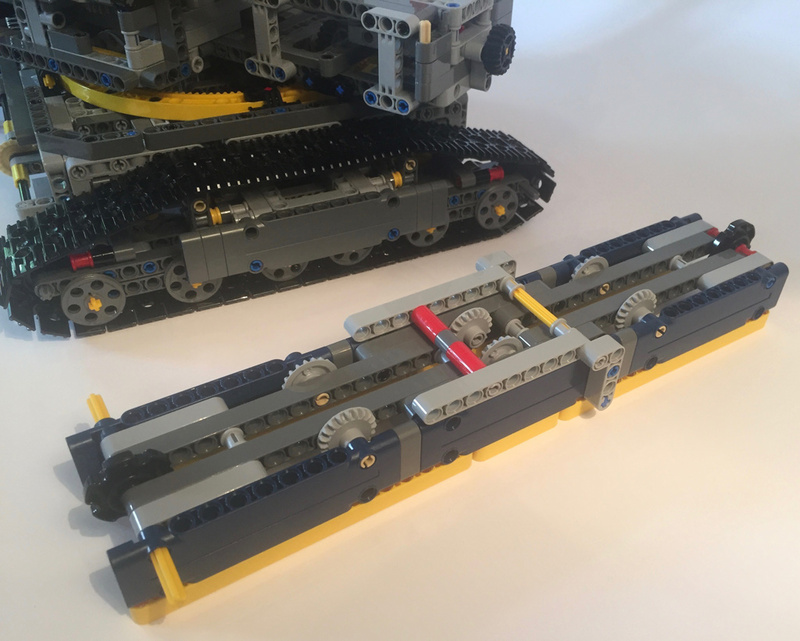 The build of the conveyor belt is straightforward and is set into motion using one of the vertical axles we built in the previous step. Also, it includes a distribution system formed with simple Technic beams, ensuring the soil and rocks transported end up on the right belt. The most interesting part of this smaller conveyor belt is its manual movement. It can be rotated almost half a circle around two of the new arched gear racks and is operated with a knob at the bottom back of the model. It also includes a rather simple yet effective clutch system operated with a driving ring. This allows the smaller conveyor belt to have three positions. It can either rotated freely, be locked or remain stationary regardless of the position of the central structure: a neat feature that enhances the playability of this behemoth even further. 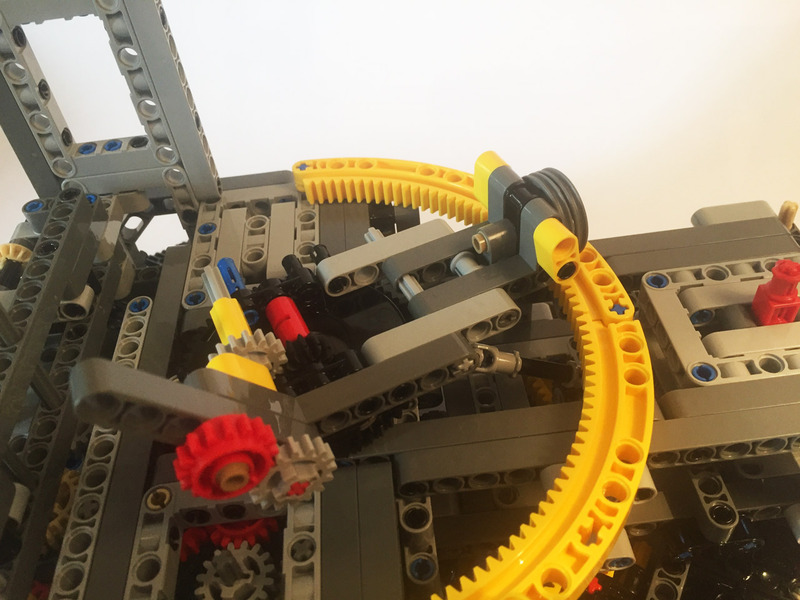 A substantive sub-build made of nine bags of parts forms the bucket-wheel and large conveyor belt. It starts with the bucket-wheel, made of two large wheels of four arched gear racks and eight buckets. 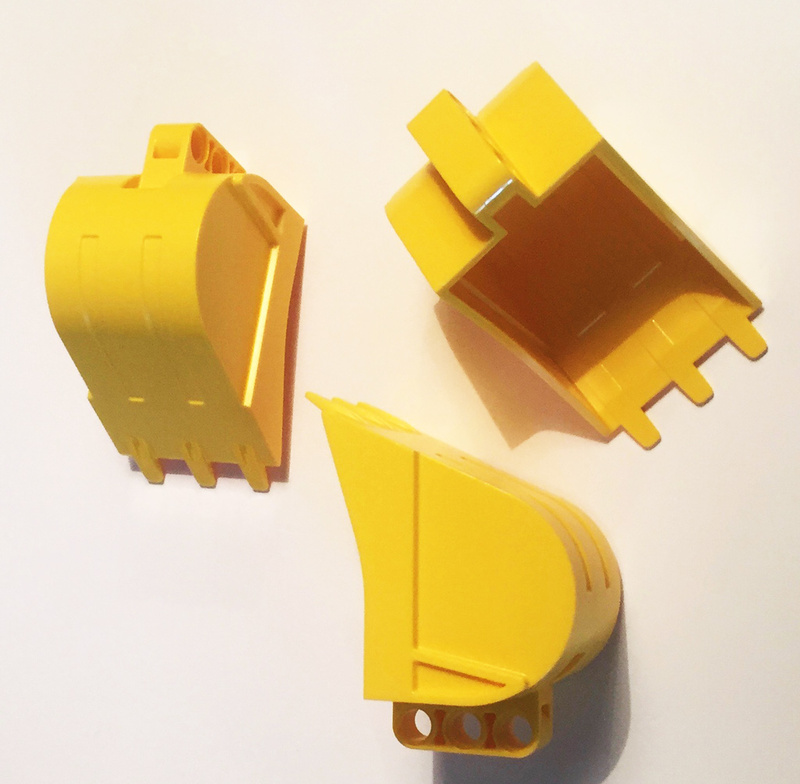 This new Yellow 4x5x7 bucket (Element ID 6145856 Design ID 24120) is a version of the small bucket that has been around for almost 25 years but has an odd number of pinholes, making it far more suitable for studless models. The big wheel is guided by a bunch of small gears and kept in place by free spinning wheels. This assembly also contains a bed made out of angled beams to make sure all soil and rocks scooped up by the buckets actually end up on the conveyor belt. This is a very satisfying assembly that is full of interesting twists and turns. The bucket-wheel is turned by the end of the conveyor belt, although I had assumed it would be the other way around. Although this set-up is completely understandable from a design point of view, it comes with a downside. Because the wheel lacks direct actuation, it becomes rather feeble. It causes a jerky motion and is easily stopped by blockages or when lifting a heavy object. This is even increased by the use of a double pair of white clutch gears near the central gearbox, which come in the next stage of building. To finish off the large arm a whole series of cross beams and panels are installed to provide extra sturdiness. The arm pivots around two small turntables that are attached to the chassis. Additionally, a series of gears are added in order to create the angle between the arm and the upright chassis. These will be connected to the gearbox that is built in the next stage. A Power Functions XL Motor, battery box and three bags of parts comprise stage seven of this lengthy construction process. The weight of the Power Functions provides a suitably heavy counterweight for the bucket-wheel. 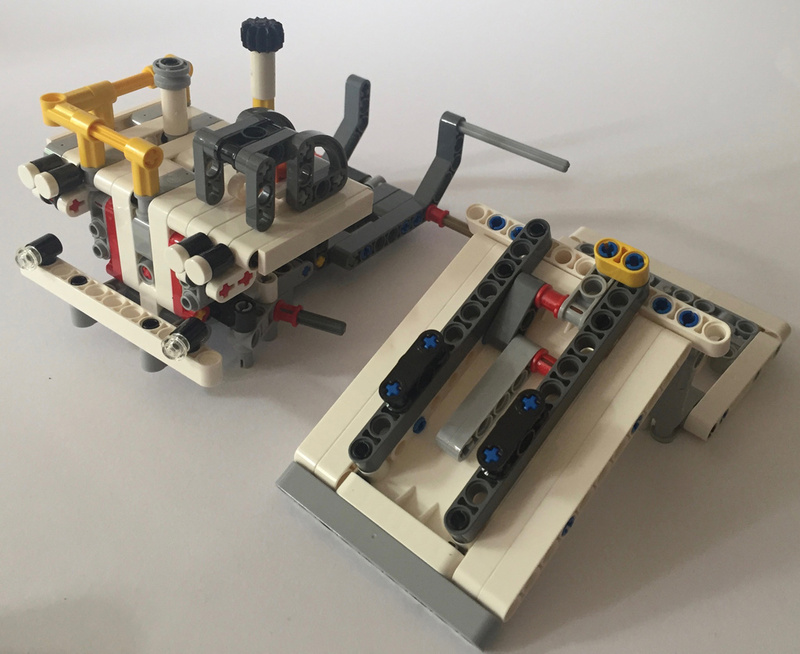 Building gearboxes can be such fun and the one that comes with set 42055 is no exception. It may not be as complex as in previous Technic iterations, but does the job quite well. 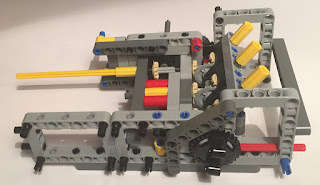 Basically the gearbox makes sure you can combine functions in both directions, however not all functions can be combined, for sake of security or lack of realism. If you do not apply decals from the decently-sized sticker sheet, this may turn out to be somewhat confusing. 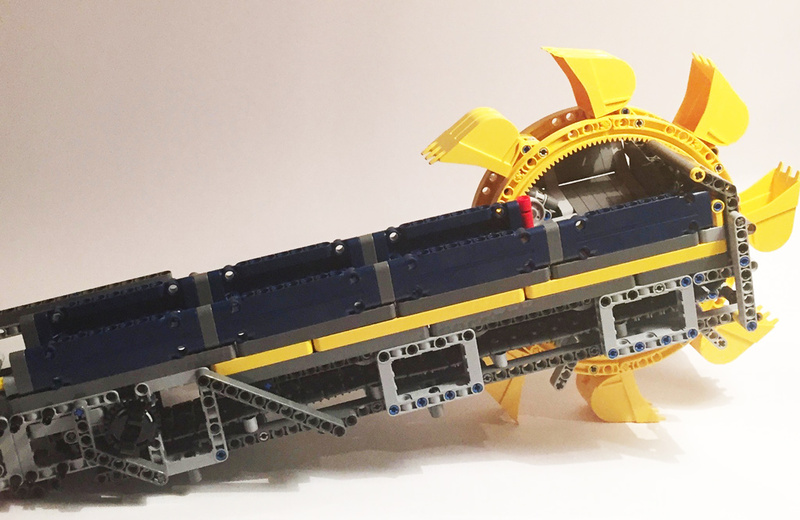 Joining both parts of the arm and adding extra sturdiness with even more beams is a satisfying undertaking. When finished and mounted on the main construction, the attachment of the arm is surprisingly solid. Unexpectedly, it turns out that a simple pair of linear actuators are able to carry and move the entire arm. This is predominantly courtesy of a well-balanced design, so, definite kudos to Markus Kossmann, who is the lead designer of this set. With construction of the first LEGO bucket-wheel excavator about to come to an end, the remaining three bags add stuff such as the white cabin which contains two tiny seats, side panels and railings. Here, at last, the new Yellow colour of odd-length axles matches the build. There is even a ladder that can be manually lifted and lowered. 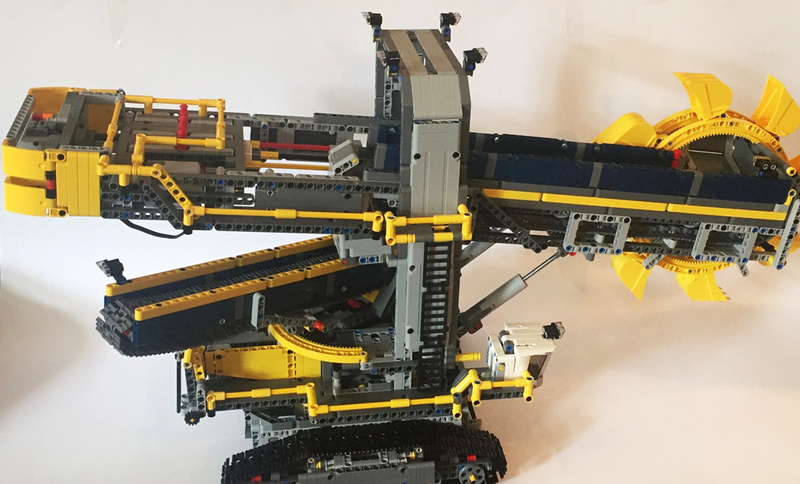 The B-model, whose instructions can only be found online, is called a Mobile Aggregate Processing Plant and is about 88cm long. It is a machine that can sort the two type of bricks that come with the set to serve as soil or rock. The machine has two motorised conveyor belts and moves on tracks. The white mining truck can be kept intact. This set is a remarkably good deal price-wise and an excellent parts pack for beginner LEGO Technic builders with a modest collection. I also applaud that the LEGO Technic team are trying to enter new terrain, by developing sets that are not yet another excavator or racecar. It certainly brings something new to their palette, and in size and extremities it will be a tough act to follow. It is a fascinating and in some ways unusual build, resulting in a truly giant piece of mining equipment. 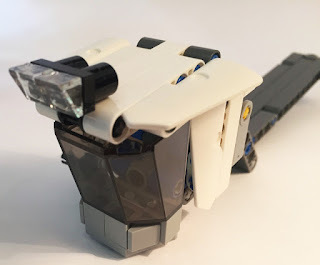 Aside from the various functions I have described throughout this review there are a lot of fulfilling play features, including the addition of the white mining truck. However the main function, the scooping and transportation of dirt, only works well if you give it a hand; the bucket-wheel does not always move in a constant fashion and is jerky. 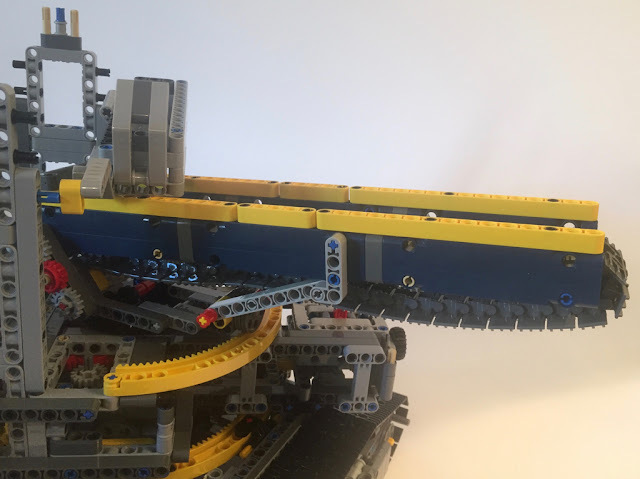 Like the real thing, most of the other motorised functions are sluggish to the extreme but this merely emphasises the physical limits of how big a LEGO Technic set can become. 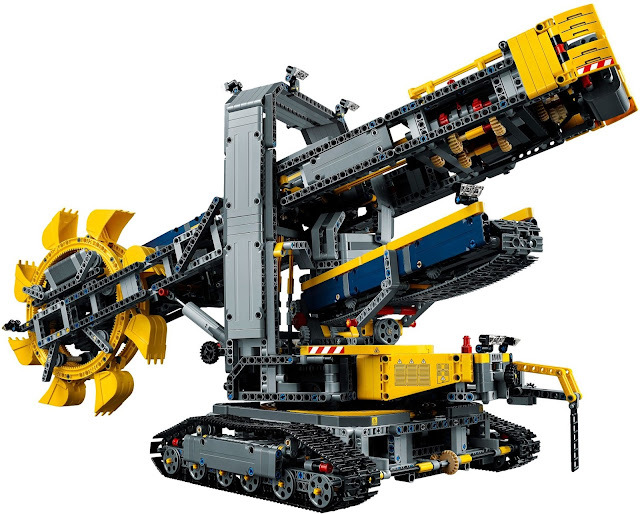 Indeed, perhaps 42055 Bucket Wheel Excavator stretches the boundaries of what is possible with axles, gears and beams. Did anyone noticed this monster is minifig scaled? Smaller than minifig scale, as evidenced by the cabin. Well, I said that according to the stairs on the side. I guess the cabin is not intended to contain a minifig in it, but I think it's minifig scale in terms of size. Very good review! I'm excited for this set and for the new pieces it offers. 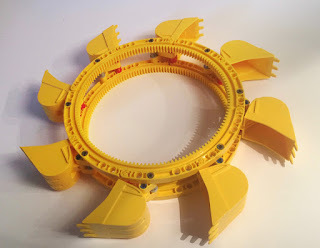 The new quarter-circle gear racks are an extremely interesting part and I'm quite curious to see what can be done with them. One possibility I had considered is using them as the basis for a new Monorail system of some sort (though the turning radius would be far narrower than traditional track). With four of them as a wheel, they could potentially be used on some sort of vehicle in a similar manner to the Hailfire Droid wheels. Train fans could also potentially find use for them in a railway turntable. But there are plenty of other potential uses for them, even beyond their use in Technic functions. You could find interesting use of them as huge arches in some sort of System build! I might not get a chance to get this set until Christmas, unfortunately. Until then I'll be holding out hope for the next LDD update (whenever that may be) to include some of these amazing new parts!